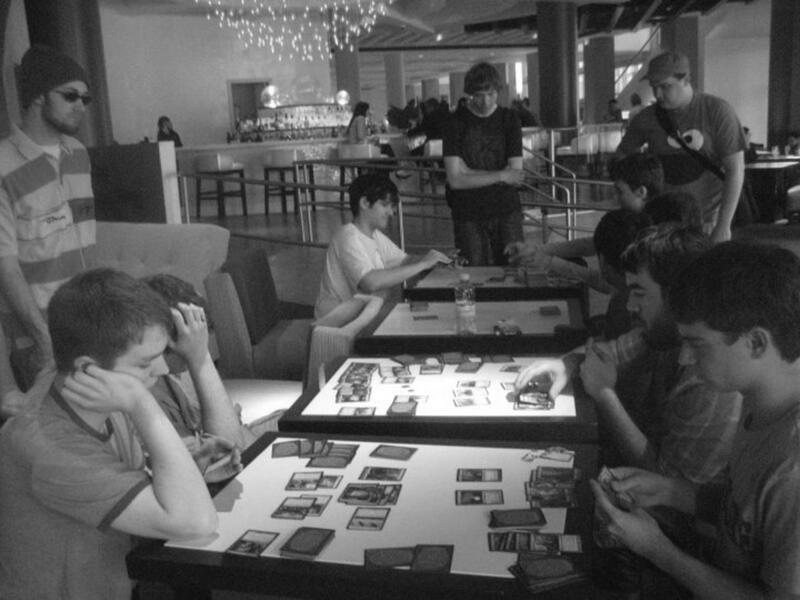 Some of the top Magic: The Gathering players compete against each other in a hotel in Japan. The beginning of a new semester is a time of fresh faces, swapped stories, and most of all: introductions. As The Observer’s beautiful typesetting and talented layout designers have already made apparent (placing it right under the headline) my name is Noah Swartz. I’m a fifth year math major with a lot on my plate while I’m on campus. On top of my writing responsibilities for The Observer, I have a radio show on WRUW (Dropped Among This Crowd Wednesdays at 5 p.m.), am Chaplain of Theta Chi (my fraternity), and am President of the Case Western Magic: the Gathering Club. Now, what could someone with such mundane interests do over the summer that would be interesting enough to write an entire article about, you might ask. Well I ended up travelling the country and world this summer playing in Magic tournaments. For those who are unaware, Magic is a collectible card game, meaning that for every tournament there are a certain group of cards that you can buy, collect, or borrow and play with. The goal of the game is to ‘kill’ your opponent using spells designated in the cards, and to do so takes a good deal of aptitude and strategic thought. It’s a fantasy themed game, so some of the cards have what might be considered “nerdy” themes such as dragons, angels, vampires, and lhurgoyfu but the trappings of the game are not the important part. The rules are pretty simple, but finding the correct play every turn to allow you to win can be quite hard. The ability to travel the world for the game comes from a group of tournaments called the Pro Tour. They are usually held in exotic locations, and the total prize pool for each one is $250,000, with first place winning $40,000. These tournaments are invite-only and usually have about 350-400 players in attendance. If you do well enough on the Pro Tour, you can qualify for the next one and eventually hit what is lovingly referred to as “the gravy train” where you are qualified for every Pro Tour each year. I got my start on the tour back at PT Honolulu in June of 2009 where I ended up 54th out of 396 players. Then I went to PT San Juan this last May where I placed fourth out of 396 players. With that top four performance, not only did I win some prize money but I also managed to qualify myself for the next four Pro Tours as well as the next two national and world championships. But my travelling didn’t stop there; after San Juan, I went to Japan to play in a Grand Prix (93rd out of 900) but mainly to see the country. From there I almost decided to go to Manila at the last minute, but opted out. Still, when I got back I placed in the top eight of two continental tournaments, one in Columbus and one in St. Louis. In Puerto Rico, I enjoyed the sun and shore, and had a few interesting interactions with the locals. In Japan, I explored Tokyo, Sendai, and Kyoto. On that trip I spent the most time travelling out of any of the tournaments that I’ve travelled for and it definitely paid off. I’d have to say the best part was Harajuku, the major shopping district in Tokyo where I spent a day happily exploring its winding streets and stumbling from boutique to boutique in a fashion crazed stupor for the better part of the day. Also each city in Japan is by design beautiful. After getting so accustomed to the banal mediocrity of so many unimpressive Midwest Meccas, seeing a bustling, nearly futuristic, Japanese urban hub can almost be overwhelming. The food there was delicious as well, but as a vegetarian it was a little hard to find things to eat sometimes. As far as cuisine goes though, Puerto Rico takes the cake. Say what I will about the sometimes-rundown cities and oppressively humid climate, they sure know how to make a good plate of plantains there. On top of that, some of the ritzier sections of the city had some amazing Puerto Rican fusion restaurants that seamlessly combined traditional island food with Japanese, Indian, and many other cuisines. Even though travelling was a blast, after nearly three weeks of being away from home, I was pretty glad to be back. I arrived home just in time to go to Minneapolis for Nationals, Gotenburg Sweeden for another Grand Prix, Amsterdam for the next Pro Tour, and then Portland and Toronto for two more Grand Prixes all in the next month. Then right after Finals I’ll be on my way to Chiba Japan for Worlds. All this traveling in foreign countries can be pretty taxing, especially when you factor in all the culture shock. In regards to language barriers, I luckily haven’t had too much of a problem yet, and as far as playing the game goes, that can be done almost entirely without words, as long as you and your opponent can avoid disputes. Luckily the judging staff at most tournaments is pretty good about having people who can accommodate foreign players. The worst thing that has happened to me was when I found out that Puerto Ricans use Pork Crackling in place of butter, so the mashed plantain dish called Mofongo that I had had the last two nights had been full of delicious non-vegetarian ingredients. Or maybe it was when a carful of punk teenagers almost beat us up because we were walking on the wrong side of the street. Or when I got on the wrong cross country train in Japan and got separated from my brother who was the only person I knew there who spoke Japanese. Luckily I’ve managed to avoid any run-ins with the law and never been in any serious danger. Unfortunately with all this card playing, I didn’t have any time for a real job. Preparation is a big part of the game, so even when I’m not playing in tournaments I’m constantly testing out new ideas or practicing to get better. I don’t mind much though, because I essentially can do whatever I want all summer most days, and then show up to tournaments and collect a paycheck.